and fun she would always poke. and up went her house in smoke. Laurence always knew that his mother was beautiful, also encouraged by the frequent compliments of his school mates. In later years he wondered if his views were perhaps coloured by the fact that she was his mother, but now looking at her photos with more mature and objective eyes, he confirms that she really was a beautiful woman; and also that Dino was no less a handsome man. 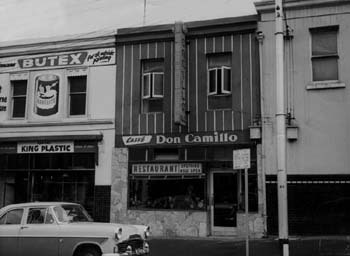 The success of the investment in these two shops permitted the Camillo's to visit Europe in 1952. It was the first in a long line of astute investments in real-estate, which was to become Dino's main business. Jannina, being still very small at the time, remained with grandma Clelia, while the rest of the family went by ship to England where they bought a car, then motored through Belgium, France, Germany and down to Italy. At this time, Italy was still struggling to get back on its feet after a destructive war and poverty was still sending many young men overseas to seek a better fortune. Dino's arrival in a rare and "flashy" car, followed everywhere by crowds of barefoot children, probably encouraged many previously hesitant young men to take the plunge and emigrate. Their kind friend Archbishop Mannix arranged an audience with Pope Pius XII. They made the trip down to Rome with the newly ordained Father Armando (Dino’s brother) and made a special visit just south of the city, to the elderly mother of Saint Maria Goretti. Referring to the sainthood of her daughter, Mrs. Goretti said: “They made a saint of her, but I would have preferred to have Maria alive here today”. Then, clasping Rina’s hand, counselled her: “Be close to your children and be a friend to them, so that they will readily confide in you”. After having sold the fruit shop Dino went into building and constructed the typical Australian wooden structured houses “brick-veneered”. He had to learn the wood carpenting trade in order to build the wooden frames of the homes. After that he entered the concrete paving business, specialising in the beginning, in paving the driveways of the homes in the suburbs, for which there was an unending demand. This little business grew in time to become a fully fledged construction company, employing about 20 Veneti, whom Dino had invited to Australia from his home-town. The firm operated all over Victoria and included the State School of Echuca and the restructuring of the cathedral in Bendigo. Over the years the Camillo family changed homes many times in Melbourne, Prahran, Moorabbin, North Melbourne, Saint Kilda, Middle Park, each time, either building a new home or restructuring an old one, but always improving their economic situation. One of these ventures was the purchase of an old milk-bar, which Dino refurbished and opened one of Australia's very first Espresso Bars in Victoria St, along the Italian tradition and called "Don Camillo". This proved to be an enormous success with the Italian community and became the meeting place in Melbourne for Italians and also for all visiting celebrities from Italy. Rina's extrovert and communicative personality contributed to its success; her mural portrait can still be seen there today. The current owner donated the old Gaggia espresso coffee machine to the Melbourne museum, and is now on display as a relic of early Italian culture in the city. Dino encouraged his brothers to come to Australia and was joined by Terry, Johnny, Luigi, sisters Maria and Bertilla. 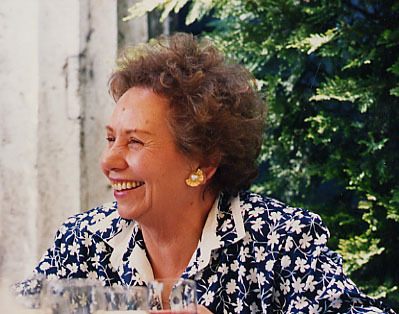 Maria married Ercole Cester, whose sister Fannì was to become one of Rina's closest friends, making close ties between the Camillo and the Cester family. Terry joined forces with Dino in the construction business and established the "Camillo Brothers" company and later on by his youngest brother Johnny. This also included a cousin of theirs from Giavera, Beppi Crema, who was the foreman. The four of them made a hard-working team and went from success to success. At their depot in Martin Street, Saint Kilda, they also sold sand and gravel to other firms, which on Saturdays, was loaded by the young Laurence with a front-end loader, to earn his ten shillings pocket money for the week. Here they also started up a terrazzo paving business (polished marble floors with the marble chips imported from Italy) and brought over the first semi-automatic tile making machines, which produced an amazing four tiles at a time. This new method revolutionised the business and helped change much of the face of Melbourne. An interesting curiosity was notified by an American reader, who found trace of a very early "Camillo Bros" in California, dating back to 1938, of Bartie and Anthony Camillo. 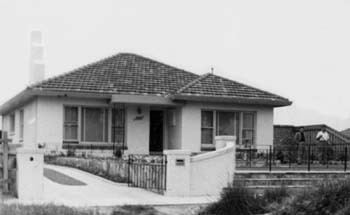 The Camillo's last residence in Melbourne before returning to Italy was in a sea-front property in 312 Beaconsfield Parade in Middle Park, which was an old mansion restructured by Dino into three flats. 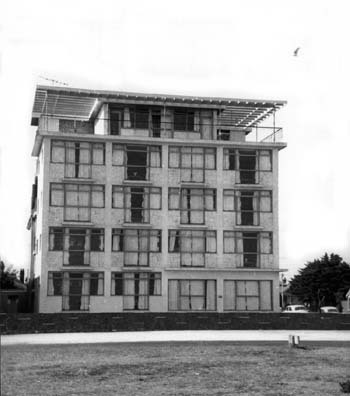 On the same grounds he also managed to build a small block of 21 bachelor flats.